Make everyone crave SweeTARTS for St Valentine’s Day and Easter. In the US, during holiday seasons such as St Valentine’s Day and Easter, people indulge in eating candies. They gather with their loved ones or family and they allow themselves to enjoy more treats than usual. But despite the festive mood, candy brands show little originality. Valentine’s Day and Easter candies tend to remain a bit cliché – heart shapes, eggs and so on. Fortunately, in the candy world, there is one brand called SweeTARTS that is really “from another planet”. It’s surely one of the most fun, innovative and bold candy brands around. SweeTARTS are hard to classify. 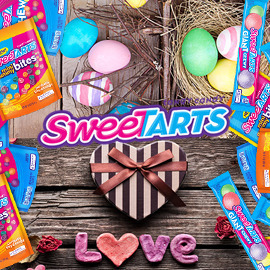 Wow us with your incredible idea for a new seasonal offering of famous SweeTARTS candies, to be sold during St Valentine’s Day or Easter, in the US. FORMAT: Product design: presentation of ideas with illustrations and text and one page of summary (with the provided template). Entries will be accepted till May 18, 2016 23:59 UTC!